Waste solids, particularly those from dairy freestall housing bedding, can accumulate quickly in waste storage ponds. Solids accumulation requires longer, more thorough agitation at pump out time to re-suspend settled solids and special manure solids handling “chopper” pumps for transfer to tanker wagons or waste slurry irrigation systems. Solids can cause pumping problems, and over time can greatly reduce usable storage pond volume. Serious consideration is usually given to the installation of solids separation equipment between animal housing, particularly dairy freestall barns, and the waste storage pond. Mechanical separators are typically either rotating or stationary screens and generally remove 20 to 30 percent of the waste solids. These separators require little attention although operation in freezing weather requires special considerations. They produce manure solids that may be easily recycled as bedding or land applied off-farm with solid manure spreaders. Properly designed gravity settling basins can remove up to 50 percent of the waste solids but need enough elevation between the barn collection channel bottom and the maximum storage pond liquid surface height for installation of the settling basin and associated minimum 1% slope gravity in/out transfer lines. Gravity settling basins require periodic cleaning out with a tractor front end loader and work best when at least two are constructed side by side to allow alternating use and some manure solids drying out before cleaning. 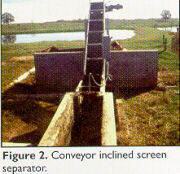 Separated solids can be handled by conventional manure solids handling equipment. These nutrient-rich solids can be spread on distant fields and pastures as fertilizer and soil amendments, or sold for horticultural uses, with or without composting. Removing solids that retain their nutrients can help reduce nutrient loading on nearby fields, which are often irrigated from storage ponds or lagoons during the periodic pump outs required for proper management.